Brand-new studio Tokyo RPG Factory, the Square Enix representative told me, was set up to create new projects that would “bring players back to the golden age of JRPGs.” That might be enough to give hope to those left behind by the newfangled battle mechanics and cutscene-heavy nature of Square Enix’s more recent projects, but then again, actions speak louder than words. 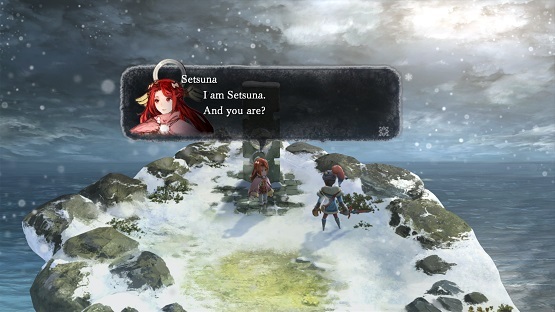 That’s why I made sure to get a hands-on preview of Tokyo RPG Factory’s first game I Am Setsuna — I wanted to see if it really lived up to its promise of old-school gameplay and new-school graphics. As a whole package, I Am Setsuna feels like a combination of Chrono Trigger and the Nintendo 3DS-exclusive Final Fantasy throwbacks Bravely Default and Bravely Second: End Layer. Just the mention of the former game is enough to make longtime JRPG fans start panting from anticipation, which is why Square Enix has made it a point to advertise the fact that the game’s combat system was “inspired” from that 1995 classic. And yeah, let’s address that part right now: this combat system, which has an ATB bar and sees enemies and party members moving about the battlefield depending on the moves you use, is pretty much a dead ringer for the one in Crono’s old adventure. That’s not necessarily a bad thing, though, especially when Tokyo RPG Factory went into development with the goal of inspiring nostalgia — and rest assured that they’ve added a few interesting wrinkles of their own. One of these is the “Momentum” system, which relies on the game’s SP points to work. Get one, and you’ll have the opportunity to pull off a well-timed Momentum move that adds bonus effects to whatever ability you’re currently using; time enough Momentum moves correctly, and you have a bigger chance of triggering a random Singularity that benefits your party in some way. This system gives you a little more incentive not to just mash the attack button, and it’s going to be interesting to see how using Momentum affects your various abilities in the final release. The presentation of I Am Setsuna seems to be the thing that will set it apart from its classic JRPG inspirations the most. Visually, both in key art as well as the game itself, the scenery has been crafted with a very soft and delicate touch. Light colors, simple lines and an abundance of snow seem to be common themes, and the overall effect is quite pleasing to the eye. Since a tragedy is at the heart of I Am Setsuna, it’s fitting that artist toi8 — who did artwork for the similarly-solemn light novel and anime series No.6 — was brought on to lend a sense of somber beauty to the graphics. Of course, it’s not all doom and gloom; the character models themselves are rendered in appealingly adorable chibi form, much like the aforementioned Bravely titles and the Nintendo DS remakes of Final Fantasy III and IV. I only got to explore one village and dungeon during my time with the game, and while these areas were fairly simple, I’m eager to see what else the game has to offer in terms of visuals. Perhaps one of the most striking elements to me, which really hammers home the heartbreaking narrative at the center of the game, was the soundtrack. It is, and I don’t think I’m exaggerating here, unlike any music I’ve ever heard in a JRPG. During the preview build I played, just about every track — from the one serving as the background tune to the village to the one playing throughout the end-of-demo boss battle — features piano as its major instrument. I have no doubt that I Am Setsuna is going to win the hearts of gamers who grew up among the likes of Chrono Trigger and any of the the first six Final Fantasy games. Sure, such an idea almost seems like a cliche at this point — there’s a seemingly endless catalogue of indie games inspired by the likes of those golden oldies — but Tokyo RPG Factory seems to have a good handle on how to keep Setsuna from getting too derivative. With a soft, painterly style created by Toi Hachi and an intimate piano score by Tomoki Miyoshi, the gentle presentation may just be the game’s defining element. And thankfully, experiencing it is just around the corner for Western JRPG fans: I Am Setsuna will be a digital-only release on July 19.